I grew up watching the 700 Club on a regular basis, my mother was even a paying member. At the time, my favorite part were the stories of people "finding" Christ, particularly because the reenactments of their pre-Salvation lifestyle made up the most interesting things on the program. As I became more moderate in my religious and political views, I lost interest in Pat Robertson and his activities. He dropped off my radar until he hit the news again hen he advocated the US assassinate Chavez. After that I started paying attention to Pat's shenanigans. Mostly, I'm amazed at just how easy it is to manipulate and fool people using religion. For example, Pat Robertson has, yet again, made a list of predictions for the new year. In light of the collapse of the home mortgage industry, the plummeting dollar and the rising price of oil you'd have to be pretty dense to not expect an impending recession. 43% of Americans thought we were already in a recession in early 2006. God seems to be asleep at the wheel, having just now noticed what close to half the country could see in December of 2005. The information age must be pretty daunting for the being who created time, if he's running a full 25 months behind the average "liberal" blogger. Well, God seems to have read up on Peak Oil. With Oil at $100 a barrel at the start of 2008 and the prospect of the US invading Iran before the 2008 elections, $150 a barrel oil isn't too far fetched an idea. The US Dollar started 2008 by falling against the Euro and the Canadian Dollar. A review of how the Dollar has fared since 1999 gives a bleak picture of continuing decline, a depressing downward trend with no sign of relief on the horizion. "I also believe the Lord was saying by 2009, maybe 2010, there's going to be a major stock market crash,"
Gee, ya think? What on Earth would lead God to suspect such a think would happen? Multiple smaller stock market crashes over the last eight years. Decades of US industry being outsourced to other countries. Thats just what I can list off the top of my head. Is God really limited to predicting the blazingly obvious? Has senility taken hold in his old age? Does his omnipotence just not scale to the point of dealing with a world with 6 Billion people? Additionally, "the Lord was saying there's going to be violence and chaos in the world," Robertson said. He cited violence in Kenya and Pakistan, saying "we've just begun to see what's going to happen." Again, God seems to be dealing with the obvious. Pakistan is run by Pervez Musharraf, a military dictator who has been running the country under martial law since November, 2007. He's been implicated in the assassination of Benazir Bhutto, a popular pro-democracy leader. She was working to overturn his government and it looked like she had a good shot at achieving that goal. The country is vital to the U.S.A. strategy for the "War on Terror" and a governmental collapse will likely result in a US military occupation. I'm hard pressed to find something about that scenario that DOESN'T scream "Increasing Violence." I'd be similarly hard pressed to find anyone even remotely familiar with the situation who doesn't expect more violence and bloodshed. While a peaceful resolution is possible, it's highly unlikely. On Wednesday, Robertson, 77, implied that God informed him who will be elected president in November. He CLAIMS to have inside information on who will win the 2008 Presidential election, yet refuses to reveal who that divinely chosen person is. If I were the sort to doubt the divine nature of Pat's information I'd say he was just setting himself up to dance around and chant "I knew it!" when the election results are in, regardless of who actually wins. I'd like to offer the following challenge to Pat Robertson: 1. Write down what God has told you about the 2008 Presidental election 2. Seal it in an envelope. 3. Mail it to me. If you agree to do this Pat, then I vow to put the envelope in a safe deposit box and keep it there unmolested until December 1, 2008. That should be more than enough time for the votes to be counted and any "irregularities" dealt with. I'll open the envelope and announce to the world who God told you would win the election. I see no reason why Pat should object to this plan. It allows him to prove his prophetic connection to God while avoiding a nasty, scathing commentary from Andy Rooney. Of course, if Pat is a liar and a false prophet, then he'll ignore my offer. "He told me some things about the election, but I'm not going to say, because some old man on "60 Minutes" would make fun of me, so I'm not going to tell you who the winner's going to be," Robertson said, in apparent reference to CBS humorist Andy Rooney, who turns 89 on Jan. 14. Really pat? Being mocked by an old guy on TV is enough to scare you away from sharing the 2008 election results? I seem to recall the Apostles braving stoning, crucification and a host of violent, gory deaths. Most the Old Testament prophets met violent, messy ends as well. If I had a dollar for every time I heard about a Christian Martyr being eaten by lions I could buy a new car, and yet, Pat shrinks from a humorist's harsh words. I guess God has decided to cut some corners and make prophets from substandard materials lately. You'd think out of a population of over 6 Billion, God could fine one or two men and women who had the spine to stand up to a geriatric humorist. I can only imagine the blubbering, pathetic pile Pat would become if confronted by Roman Centurions or Pagan hordes intend upon sacrificing a missionary. Of course Pat could just be hedging his bets. God did to Pat about that 2007 Nuclear attack. Pat claims that it must have been averted because a lot of people prayed, but its still gotta sting, particularly after the misinformation Pat was given in previous years. January 2004: "I really believe I'm hearing from the Lord it's going to be like a blowout" re-election for President Bush. If God considers a 51% a "blowout" I'd hate to see a close call. Of course I have to address this quote as well: Robertson said he received no divine information about the war in Iraq. In past years, he said, "the Lord told me it would be a disaster; well, it has been a disaster." You should have told Janeane Garofalo's critics about that bit of divine intelligence before the invasion. You, God, and most the world outside of the Bush and Blair administrations thought the same thing. 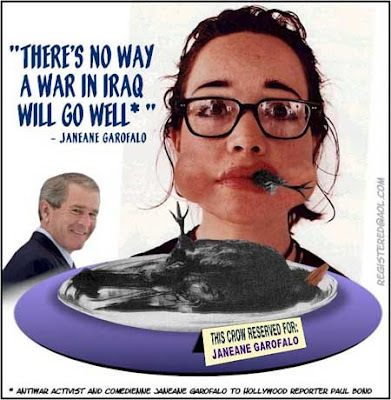 Why I remember the following attempt to mock Garofalo for saying a US Invasion of Iraq was a bad idea. Of course, the way things have gone post invasion shows that it's Bush who should be eating Crow, but that's another story. Pat is sticking to predictions that are not just safe, but downright no-brainers. He's taking what secular prognosticators are already saying, claiming it's revelation from God, and regurgitating those predictions as his own. I'll be waiting for that envelope Pat, the one containing God's messages about the 2008 elections. I'll be waiting, but I won't be holding my breath.